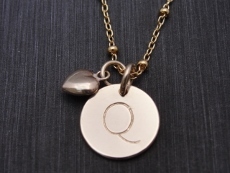 Our gold initial necklace is a custom 14 karat gold filled disc that is hand stamped with a favorite initial. Choose between discs that are 1/2", 5/8" and 3/4" and are stamped in larger block or scroll font and comes with a smooth finish. 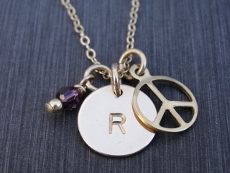 The initials are hung on 14 karat gold filled link or satellite chains measuring 16", 18" and 20". To order this item, please select a style, chain length, enter initial (one per disc), then click the Add to Shopping Cart button.